We have a trove of good seafood in our freezer, and the other night we were trying to think of a good use for some of it. We had recently been to Whole Foods, where we found a bag of spinach spaghetti – whole wheat spaghetti that has spinach mixed into the pasta dough. One thing led to another, and we created this recipe using the seafood, spinach pasta, a few strips of bacon, and some lemon zest and garlic. 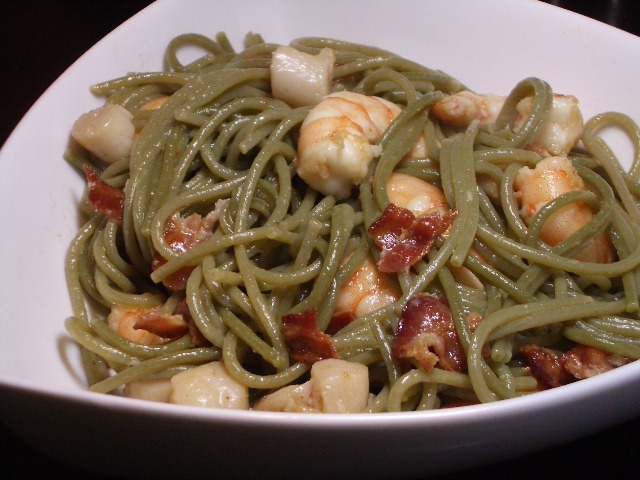 As we were enjoying the great flavor combination of the salty bacon, the seafood, and the light lemon zest, it occurred to us that this was a pretty healthy dinner: whole wheat spinach pasta, good seafood, and not much butter or oil. The few strips of bacon (which, by the way, only have 35 calories each) could be left out to make it healthier, but what’s the fun in that? looks like this could be a favorite! yummy! That looks AWESOME! I love shrimp and bacon, and the hubby is a huge scallop fan. Wonderful recipe, so simple, gonna have to try it! Good use for seafood in the freezer :).